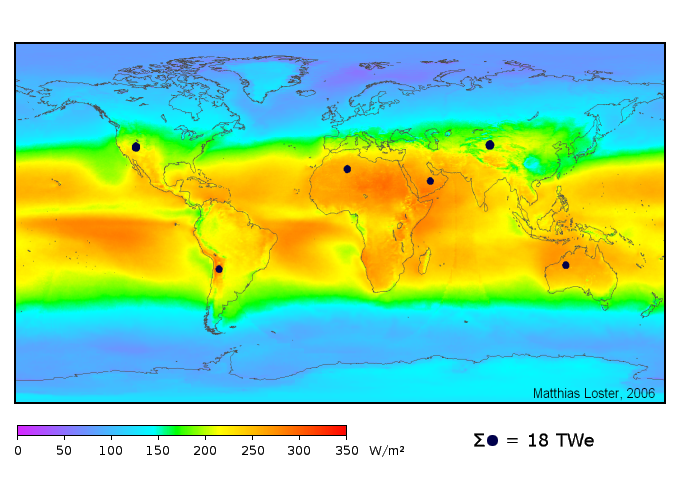 The land area needed to produce 18 terawatts (50% larger than 2010 value) using 8% efficient photovoltaics, shown as black dots. Annual insolation. Multiply values by 1000 and divide by 24 to get units of W/m². 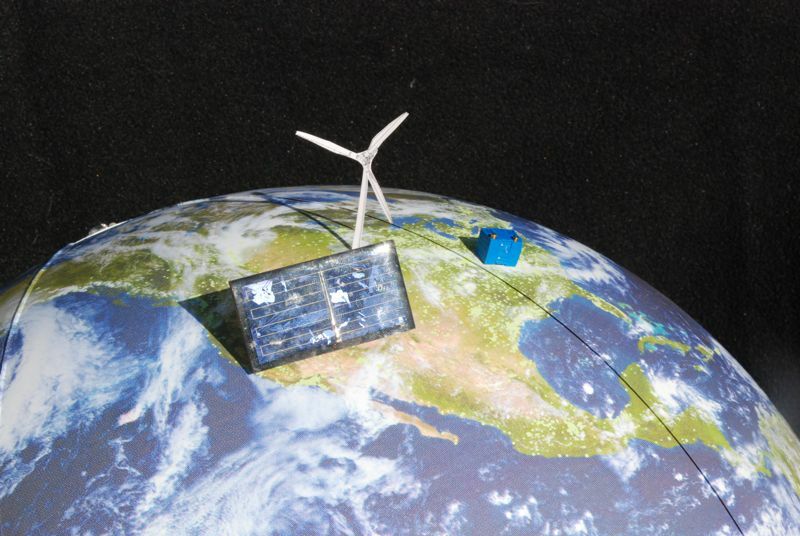 This entry was posted in Energy, Energy Scale and tagged photovoltaics, solar, wind by tmurphy. Bookmark the permalink. So Fossil fuels still beat the pants off of solar or wind. Why not use Wind or Solar to produce liquid fuels? Several methods are possible, syngas to methanol or nitrogen to ammonia. Renewable->liquid fuels just doesn’t get round the problem, apart from the storage one, but whats the round trip efficiency of these processes? The best might appear to be algae since the conversion on solar energy to liquid fuel is reasonably direct though the efficiency is of order 1%, much poorer than a PV panels 15% or so. It always better to use the energy in the form you get it. Personally I was quite dissapointed when a wind turbine wasn’t built near my house, I think the noise issue is over-rated. I’ve stood beneath very large turbines, even then you could easily hold a conversation. I find wind farms to be nightmarish eyesores on the landscape. And can we ‘do the math’ on the energy cost of maintaining such an army of gigantic propellers? Windmills are a lot of mechanics and parts. Parts break and wear and need fixin. PV are solid state and only get damaged when “attacked” externally, as all things do. I think the best way forward is to have nuclear (Type IV, Breeder) power as a base source on a shared grid. With distributed PV on roof tops of homes/businesses that gets used at source or sold back to grid. Distributed-Location solar thermal and PV (a combination of individual to community scale systems) – if installed before some political event disrupts the global triangle energy flow, or the credit markets and finances freeze over, or both – might preserve a comfortable standard of living in areas where basic nutrition and other resources remain locally available. The chances that our mass “developed” civilization, made possible entirely by “cheap and reliable and are their own storage and allow transportation by car, truck, ship, airplane” fossil fuels – just as life as we know it was made possible by the geometry and physics of the Earth’s orbit relative to the Sun’s radiation – will survive a transition from the womb in which it was evolved, however, are a topic that physics has a tough time quantifying. Even the pseudoscience of economics, with its magic variables and imaginary constants and such, hasn’t seemed to have much luck so far. 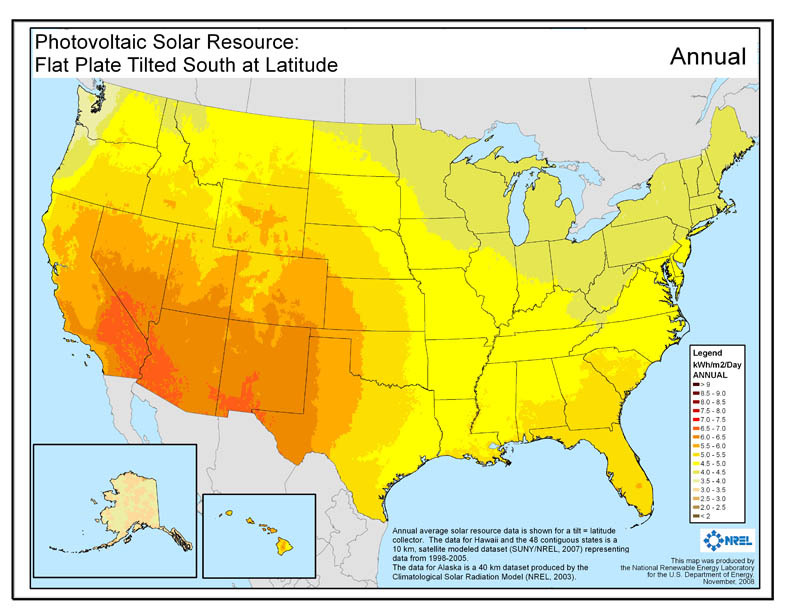 Of course, that same patch of Texas panhandle can support *both* wind turbines and solar panels. Or, much more likely, farmers will plant turbines amongst their crops. Solar panels are great for shading things. If you were already going to be shading said thing, solar is fantastic — put solar on roofs, or put solar panels on land that is somehow more productive when shaded, or at worst on land that you don’t care if it gets shaded at all. We have vast tracts of land that most emphatically cannot get shaded — specifically, cropland. But that same land can still harvest a fair amount of solar energy in the form of wind, while still being just as productive as cropland. My guess is that that’s the only way we’ll ever see significant inland wind farms — when they share the acreage with farmland. And we’ll replace offshore oil rigs with offshore wind farms. Aside from that, I don’t expect we’ll see significant wind installations. Seems that turbines on farmland would help reduce wind speed a little also which will be good for the crops. People always complain about the noise of wind turbines, but they love their freeways. They don’t love living next to one, but they like having them to drive on. 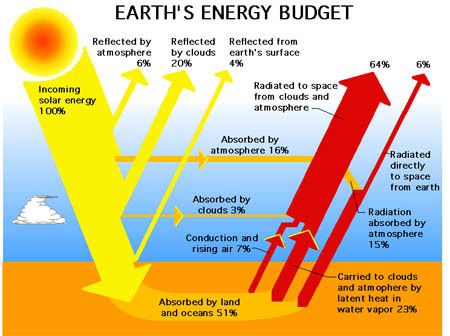 The Energy Trap will overshadow everything else, squeezing ever tighter as we descend from Hubbert’s peak/plateau. Nevertheless analyses such as these might – just might – help to make a somewhat better use of the shrinking resources in the world past Peak Everything. Thank you! Hubbert’s plateau? If there’s a long plateau then the trap disappears. A) don’t believe Yergin and company that the current plateau will be a long-lived phenomenon. B) Even so, I think it is (unfortunately) unlikely that we will experience the collective motivation necessary to pursue full-scale fossil fuel replacement until we see a decline from the plateau, in which case the Energy Trap still applies. I’d love to be proven wrong here (to see us develop alternatives in an Apollo-style program as if nothing else matters), but I don’t always get what I want. Regarding plateaus, I note that Texas production is up a very un-Hubert like 50% from it’s 2005 low. Decline must inevitable come, but it is the *meanwhile* that is interesting, as meanwhile the alternatives continue to improve. Solar, wind, geothermal, bio-fuels, tidal, storage and especially demand side conservation all continue to improve per unit power or per unit energy produced/saved, meaning their EROEI also generally improve. Even nuclear’s future is looking better via small modular and safer, high-burn up fertile fuel designs (looking forward to that post). This means that come the decline, alternatives be deployed faster per unit which works against the trap. Every percentage point increase in current renewable deployment *now* works against the trap. The first point is much like the climate change deniers pointing to a small chunk of data to make a narrow point not supported by the big picture. Texas oil on the longer view is obviously well past peak, and does not bolster a plateau viewpoint. The plan of just waiting for improvements to get us out of a fix feels to me like a boiling frog plan. It carries substantial risk. My instinct is to act on things we can control, and not assume the raft will float where we want it to go on its own. Faith is not enough for me. But this discussion is veering off topic a bit, so I’ll discontinue here. There’s an interesting real-world example of this unfolding in Ontario right now. Essentially the provincial government offered subsidies to make solar panels far more economically viable, which I see as a very good thing in the long term (http://www.theglobeandmail.com/report-on-business/industry-news/energy-and-resources/solar-sector-must-develop-business-like-strategy-ottawa-says/article2260814/). We need to be heavily investing in alternatives while we have the spare resources to do so, for anything that is built now will help to soften the landing from the energy consumption frenzy we are in the midst of. Obviously solar energy isn’t going to be a direct replacement for gasoline, but there are indirect methods that will still allow our society to function. For example, we could drastically cut our oil consumption if all office workers stopped commuting to work and instead telecommuted from home. They would still require electricity to power their computers and whatnot, but would allow the gas and oil to be rationed for more crucial purposes, i.e. food production. It’s not going to be pretty though. I’ve done some similar calculations estimating how much land area would be needed to provide x amount of GW/TW electrical capacity from solar panels . I calculated based on just pure solar panel area alone. Then I realized, of course – that solar power stations usually have a significant amount of space between panel arrays to prevent shadowing and to allow access for repair – in addition to that, solar power stations need a considerable amount of additional low-voltage wiring and high-voltage lines and transformer step up sub-stations compared to coal/nat-gas power stations. For a given surface area of solar panels – about 3-4 times as much real surface area is needed between panels to prevent self-shadowing and allow access for repairs and road access. Wind turbines also need road access. My own calculations yielded areas of land in the region of around 2 million square kilometers to provide around 10 TW of electrical capacity. This is based on a peak solar insolation of 1000 W/m^2, and a factor of 4 for the solar day and using 10% efficient solar panels . This value doesn’t include land area for power line corridors and distribution lines and step-up and step-down transformers, as well as the massive amount of additional end -point wiring or for the resources needed to manufacture all that (additional metal and concrete resources) (!). Roughly speaking, I would estimate a land area at least half again as large for resource extraction, for an additional 1 million square kilometers. Doable I suppose, but the environmental effects of using another 2.2% of land surface area in a massive terraforming project must be considerable. The largest problem is actually getting a hold of large chunks of land for such projects. This is a Spanish electrical distribution network official site. From this graph the generation mix of wind, nuclear etc are clearly visible. Today about 10% of Spain´s electricity is coming from wind, however look back to November and at times 50% was coming from the wind. Of interest is the increasing input of solar (part of Special Regime) which broadly matches peak power consumption. Also of interest is the hydro electric / hydro storage section, which provides the variable output / storage to maximize renewable production. Over the last few years the contribution by coal has gradually dropped and coal fired output has become more flexible at shorter time scales. Low wind and cloudy days are really only a problem at local scales, not regional scales. The wind is always blowing somewhere, and the sun is always shining somewhere. We’re going to need a smart grid no matter what. Once we have one, concerns about cloudy, no-wind days basically vanish. The rare “perfect storm” types of situations will easily be handled by the exact same means we currently handle spikes in demand — with high-cost standby generation facilities. Besides. Even today we’re not immune from blackouts and brownouts. Why should we let the perfect be the enemy of the better? Especially since what we have today is increasingly going to get expensive, and eventually itself unreliable due to financial reasons? Perhaps I’m biased, working for an energy storage company, but I don’t agree. There was some really good work done by Pöyry that looked at the level of intermittency in the European energy supply that would exist in 2050 for various renewable rollout scenarios using real-life weather data from this decade. The result showed very significant variation even from a wide area perspective – so even ignoring transmission capacity constraints etc the ‘sun is always shining/wind is always blowing somewhere’ mantra is more based on faith than fact. However, I totally agree that the perfect is the enemy of the good in many of these ‘scenarios’; particularly Tom your sizing of storage for 7 days energy demand is just meaningless – it would never make sense economically to do anything like this given the infrequency of such an event. Proving that it’s ridiculous doesn’t really do anything to advance the argument. The problem with standby generation assets is that they’re expensive to build, and they become a lot more expensive to operate the smaller the operating period as you have to amortize the construction and O&M costs over a smaller total number of kWh. So the answer is to have reserve capacity where the vast bulk of total cost is simply fuel cost – like gas heaters/coolers. Cheap storage, and cheap infrastructure. The inefficiency of energy conversion to get the gas from renewable sources matters a lot less if it’s only needed in small quantities (and here I’m emphatically NOT biased as my own company focusses on electrical storage anyway). As you also observe there is the potential to do quite a bit with ‘smart’ (or, at least, ‘not extremely stupid’) generation scheduling, but it’s not a cure all. Basically I think that installed capacity is going to be a much bigger problem for renewables than intermittency once they arrive. We have solutions that can manage intermittency becoming available at increasingly reasonable cost, they’re already able to be deployed (in volume, without flooding entire states) in a highly scalable way. The problem is that we, globally, are burning more coal than ever, and preparing to burn even more gas. Rather than flawed analysis that says there isn’t enough STORAGE in the grid to manage renewable intermittency issues which aren’t yet remotely limiting deployment. The problems that have occured in Germany on sunny days with ‘too much solar’ are a matter of ‘dumb’ inverter design – not too much energy. I will be more than happy to see a surplus of solar power in the grid as I *know* that economic options are available to address it… but that situation is a long way away! The issue of back up power is often floated as an additional cost. We are adding wind power to already existing systems which are already supporting peak loads, not building entire systems from scratch; as far as I know nobody has ever built new fossil fuelled power stations in order to back up wind. Spain does have standby gas powered generation assets; it is rarely used. To say that new power lines are needed is moot, every power station however powered requires new power lines. The issue of the percentage of power that can be supplied by wind within the system before instability / back up considerations is also shown to be a non problem within the Spanish system, as I say elsewhere fifty percent of the load can be taken by wind on ocassion, thirty to forty percent is common, the record is sixty percent. I do not say that everywhere can have a similar system, I use the Spanish system as an example because the information is readily available and I live here, and I know that the lights stay on here as reliably as anywhere else. 1. effective collection area: The reason why wind power is economically feasible at all is that you only put turbines in places that naturally concentrate wind energy, meaning you use a very small area to collect energy that was originally deposited by the sun in a much much larger area. This is even more true for the prime locations offshore, where my guess would be that you have hundreds to thousands of km in radius as the effective collection area. 2. and effective collection height: Windmills need to be 10 rotor diameters apart to keep power loss <10%, and that works for the largest windfarms we currently have with many windmills in a row. At 50% efficiency this means that in the distance between two windmills, the power output of a whole windmill (or 50% of the energy in the wind) is almost completely replenished from above! It can't come from insolation on the land area in between, that wouldn't create horizontal movement at all. I don't know how many windmills you can put in a row to still have this work, but current wind farms seem to not have hit that limit yet. So say we put 10 windmills in a row, we must be effectively collecting energy from a total height of about 10 rotor diameters times 50%, let's just say 500m. I may have missed a ^0.5 there, since we are not draining energy from the space in between windmills perpendicular to the wind, and so get part of the replenishing from that. On the other hand, large installations are bigger than just 10 windmills in a row, so I'm sticking to the 500m. I realize this is exactly the bottom-up approach which you don't like, but the above assumptions still seem to be working for the size of current installations. My guess is that they will stop working at a certain size, so the 17.5 TW is too optimistic. But you really should be using the lower 48 states extended by maybe 1000km out to sea as effective collection area, then use the 500m as effective height, giving about 5x the volume and thus available energy. This makes the disparity <3x, as opposed to almost 15x before, and the truth probably lies somewhere in between. I just realized that you can put my point 2. in an even shorter form: If windmills need to be seperated by 5 rotors when standing side by side to not affect each other, the same should be true if they were stacked on top of each other. So the windmill must be effectively extracting energy from at least 2.5x its diameter. Bad math: 5x separation means 5x diameters, not 2.5 (2.5 on each side, yes—adding to 5), but this does not mean extraction happens on this scale: most passes through untouched to be possibly scooped up by the next windmill. I think the 5x separation is considered relevant for a 2-D array, but a single line may be able to pack them much closer without serious negative impact. Your point 1 is reflected by the non-uniform appearance of the map: some areas are not particularly useful for wind, and other places have concentrated wind. As to point 2, if windmills are 100 m diameter with a 100 m hub-height (reaching up to 150 m), and spaced 5 rotor diameters apart, then each rotor occupies only 10% of the rectangle allocated to it (150 m by 500 m). Then each rotor extracts only about 50% of the incident wind, so that you could have 20 rows (spanning 20 km at 10 rotor diameters along-wind) without requiring vertical replenishment. Are there wind farms with this many rows? The ones I have seen from airplanes do not come close to this, but that’s not a good global sample. In any case, I don’t swallow your argument that we must get substantial vertical replacement between each row, effectively extending the vertical range by the number of rows employed. Finally, going 1000 km offshore is not on anyone’s radar: deep water wind is impractical, and discarded from all assessments I have seen. You’re on shaky ground there. Large offshore farms are around 10×10 windmills. And you misunderstood the 1000km, which I really should have clarified in point 1. I did not mean to put windfarms that far out. I meant that – especially at sea – weather systems can be that large, therefore you need to count solar energy incident on those areas as contributing to the energy contained in the wind even near shore. My initial take away from this is why wind has its uses, ultimately solar seems the preferred method of choice….and since research dollars are scarce it should get the majority of the renewable budget. While wind blows better at night than solar farms, ultimately storage and transmission is going to be an issue for both technologies, and I’d rather focus on a energy source that could theoretically scale with growing energy use, instead of one that may not be capable (within margins of efficiency) to handle even current need. I’m looking forward to the post in which you provide the mathematical underpinning for this statement. To get you started, in 2009 Germany replaced almost 10% of its old cars with new ones. Are you expecting oil imports to Germany to decline by over 10% per year? I don’t think it’s as simple as this. Electric cars are more expensive, have less range, have long recharge times, and other “features” that dissuade potential buyers. I’m betting that only the tiniest sliver of the 10% German turnover was in electric cars. I’m wondering why the area is that large if the rotors themselves only take up a small fraction of that total area, maybe ~ 5%. The wind is only impinging on the rotors, the rest passes by? What am I missing? Ah—yes, this is a somewhat subtle issue. The rotor blades act much like airplane wings. An airplane wing in level flight interacts with a very thick swath of air: much thicker than the strict geometrical thickness of the wing. It can be on the scale of the wingspan (or some sizable fraction thereof). So shifting to the windmill point of view, a thick section of the oncoming “tube” senses/interacts-with the blades as they sweep along. The net effect is that windmills capture as much as about 45% of the energy incident on the rotor circular area, even if the blades themselves only occupy a small fraction of that area. I am a big fan of both wind and solar, and I guess I cannot argue with the numbers that say that fossil fuels are currently the energy source of choice. It seems that the ‘contest’ between wind and solar came out a tie. Depending on which parameter you use, either wind or solar would come out on top. Great blog Tom. Thank you for writing it. I am interested in Fresnel lenses and their ability to deliver a lot of concentrated energy. They seem like low-tech, high-value devices that could have a big impact in our energy-starved future. The videos of boiling water, melting metals, and turning stirling engines are impressive. What are your thoughts? Also I just learned that the screen of a rear projection TV is a Fresnel lens, so there are a lot of free ones out there. So what does Lovelock mean when he says (in The Revenge of Gaia) that ‘already we are discovering that wind farms alter the vorticity of the atmosphere’. ” My earlier estimate of 0.15 W/m² of wind potential, when multiplied by the area of the lower-48 states gives about 1.2 TW. I am left to puzzle over the disparity”. When you made the calculation of 17 W/m2, you made the following assumption for a 10 km column of air of 1 m2. Undoubtedly there will be vertical mixing, and my simple estimate leaves this out. But it would never be complete mixing. The de Castro et al. work provides a hint at how significant this effect may be: a factor of four boost. Of course, they then offer a number of realistic inefficiencies that I left out, pulling their global total down to 1 TW, which is lower than I got with my simple estimate, even neglecting vertical mixing. Thanks. Fossil fuels have made us insane when it comes to assuming our energy requirements. We are totally anti-life as we are doing the exact opposite of what life has been doing on the planet – we are increasing entropy instead of decreasing entropy [the net carbon and energy locked in our 7 billion bodies is way lower than what we have increased, a calculation on that may be interesting]. Solar definitely has more potential than other sources, but we need to consider energy to collect solar energy and the sustainability of such “apparatus”, not just storage but actual collection, distribution etc. I forward your blogs to many in the overly optimistic technical community who have zero understanding of these very important problems and continue to live in fantasyland. When you are sort of “done” with your blogs, please consider putting them in a book to reach a wider audience.